ReutersVenezuela’s President Nicolas Maduro attends the handover ceremony of the Secretary General of the Union of South American Nations (UNASUR) in Caracas September 11, 2014. 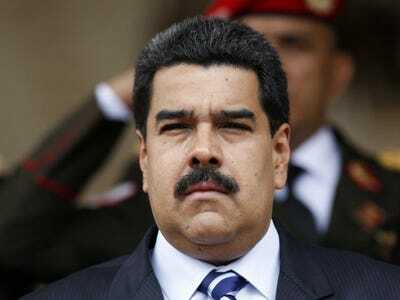 In a passionate speech on Thursday, Venezuelan President Nicolas Maduro vowed that he would not rest until oil prices were back to “where they should be,” reports Venezuelan paper, El Universal. For Maduro’s purposes, that’s at about $US100 a barrel. “We will maintain the depth and rhythm of our investments into society,” Maduro said speaking at a military celebration. “The best response in the face of obstacles is to come together in work, in struggle — it is to have discipline. On Thursday OPEC leaders agreed not to reduce global oil output, thereby increasing the price of the commodity. As a result, oil stocks crashed, and the price of oil continued its months-long slide. For Venezuela, that means the commodity that makes up 95% of its exports is not bringing in enough cash to support the investments Maduro was talking about — social programs dating back to the late-Hugo Chavez’s regime, ranging from education to social welfare. This couldn’t come at a worse time for the country. Venezuela’s inflation rate is the highest in the Americas, at 65%. Household goods are scarce, and have been for some time. Over the past month, Venezuelan bonds have been selling off at breakneck speed. All of this has been a strain on the regime, which has lost legitimacy since the death of Chavez, who was a far more charismatic leader than his successor. Hundreds of thousands marched in the streets earlier this spring, but the opposition has mostly been squashed. Now Maduro faces problems from within his own ranks, and oil prices aren’t helping. This week Maduro had a birthday, and attendance was dismal. You know it’s bad when people stop showing up for your birthday.